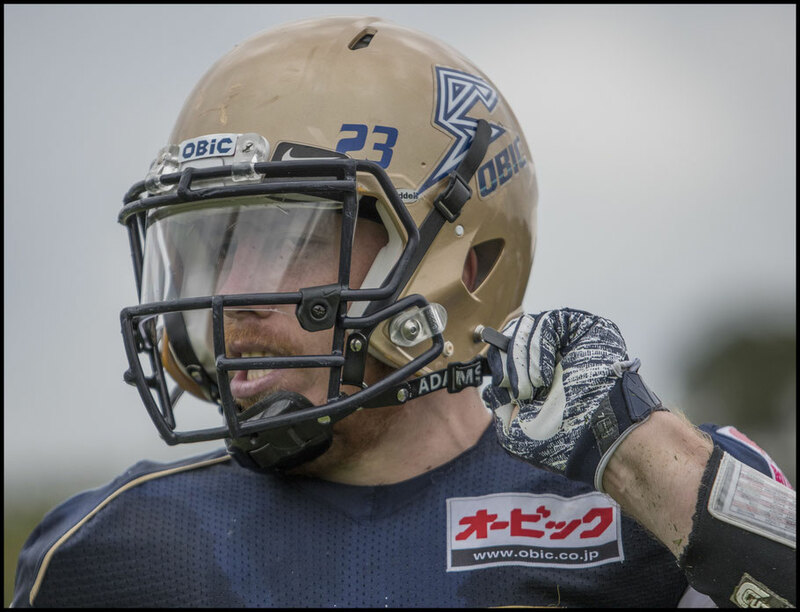 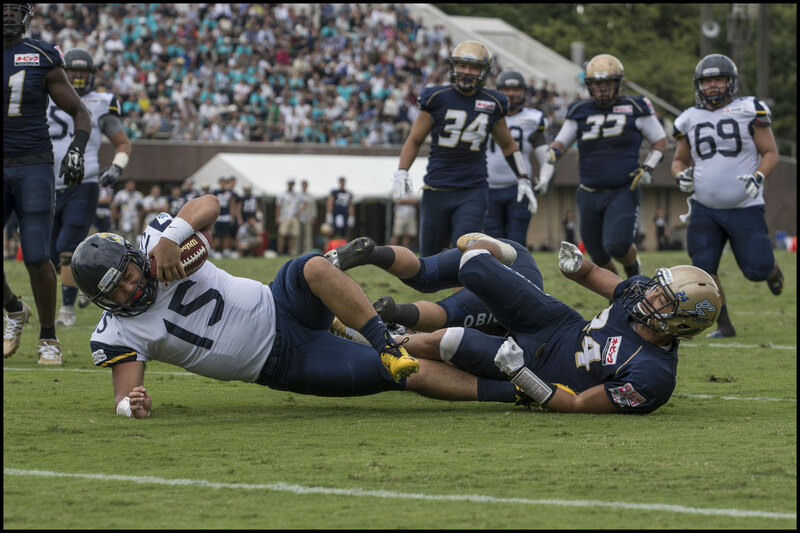 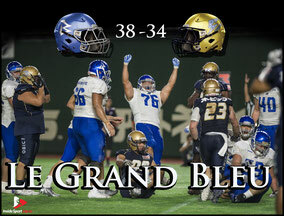 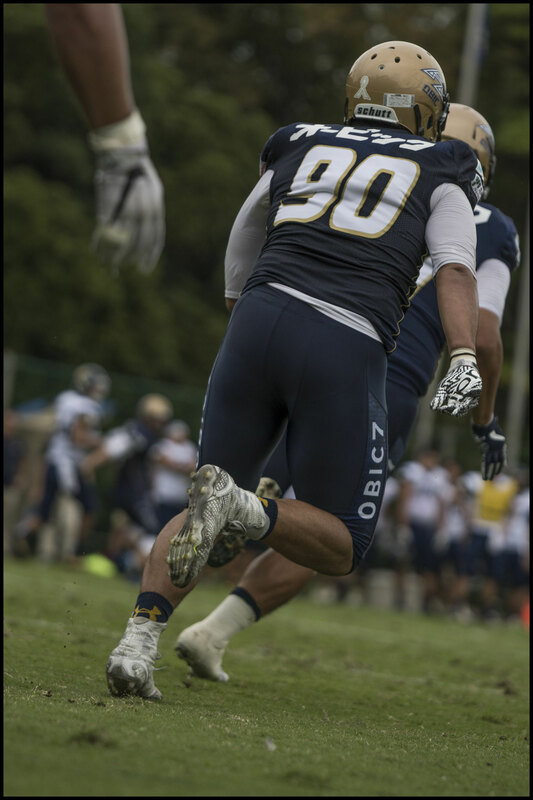 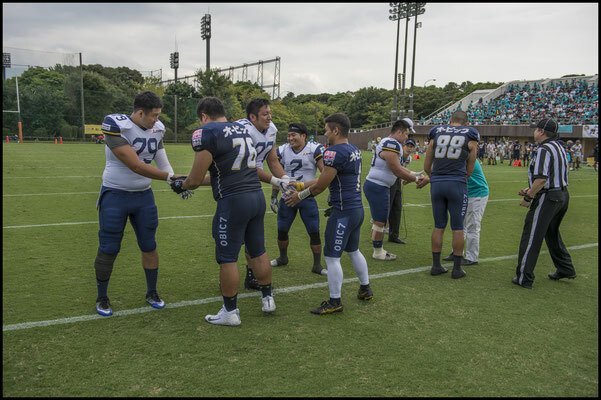 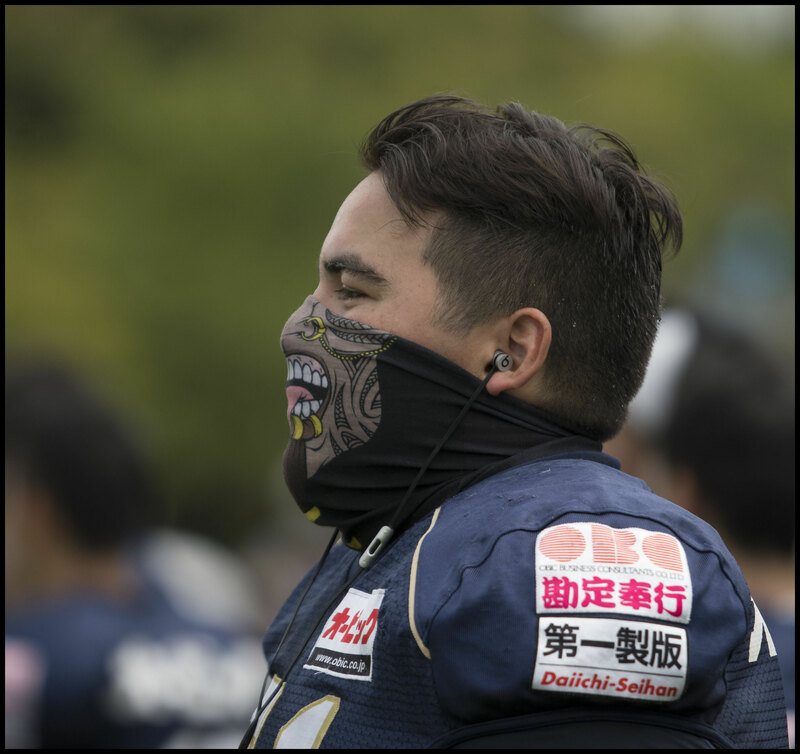 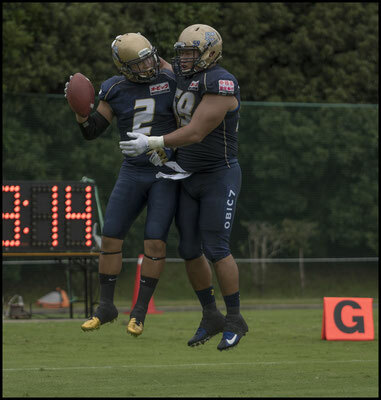 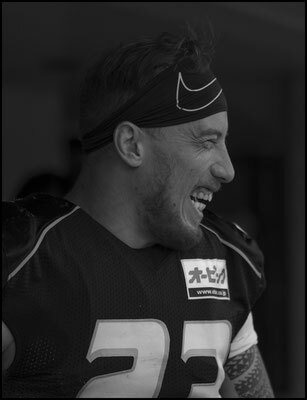 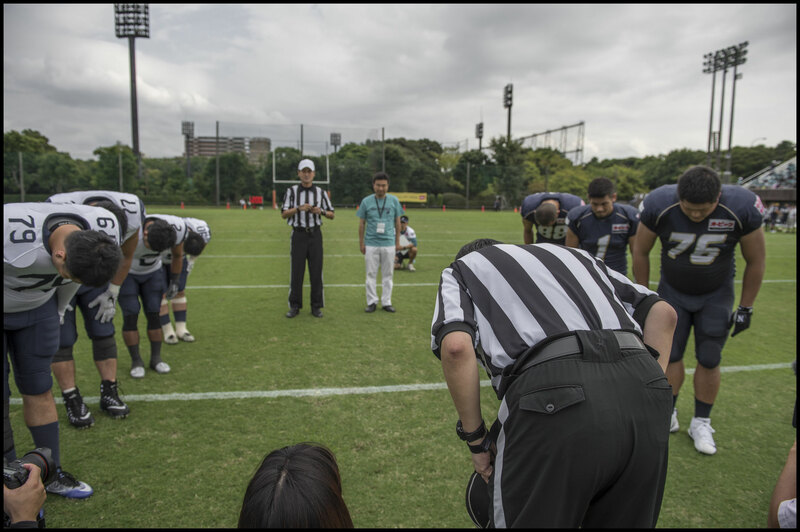 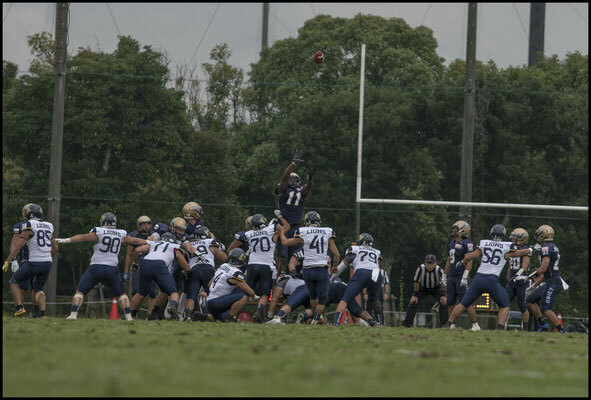 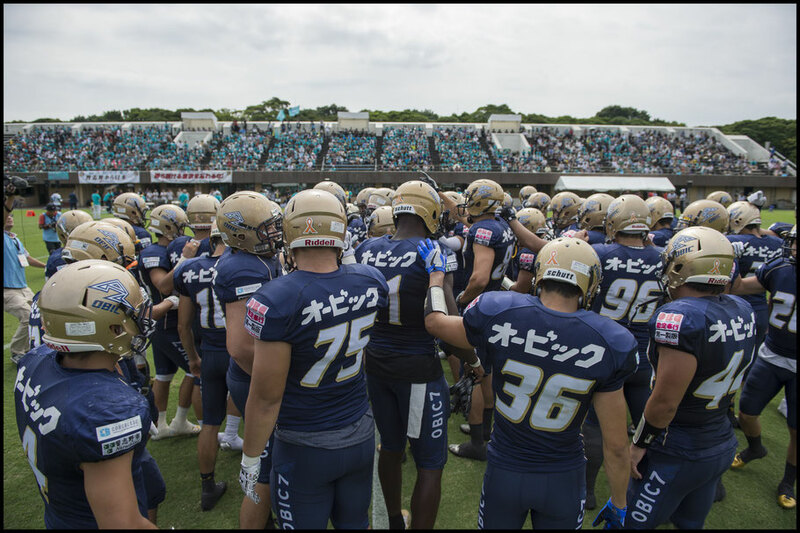 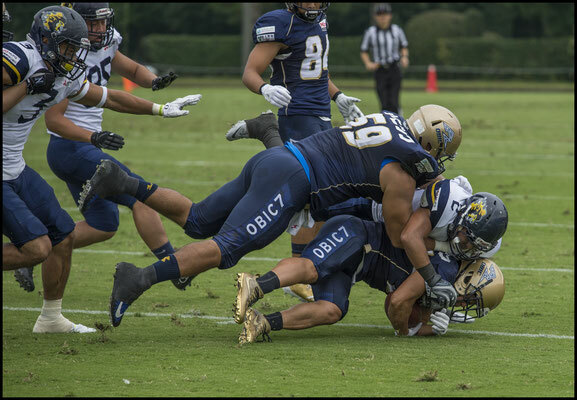 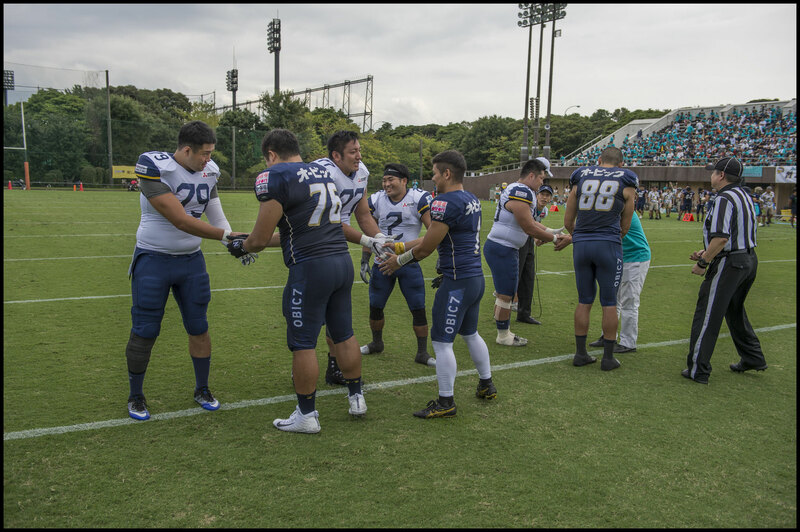 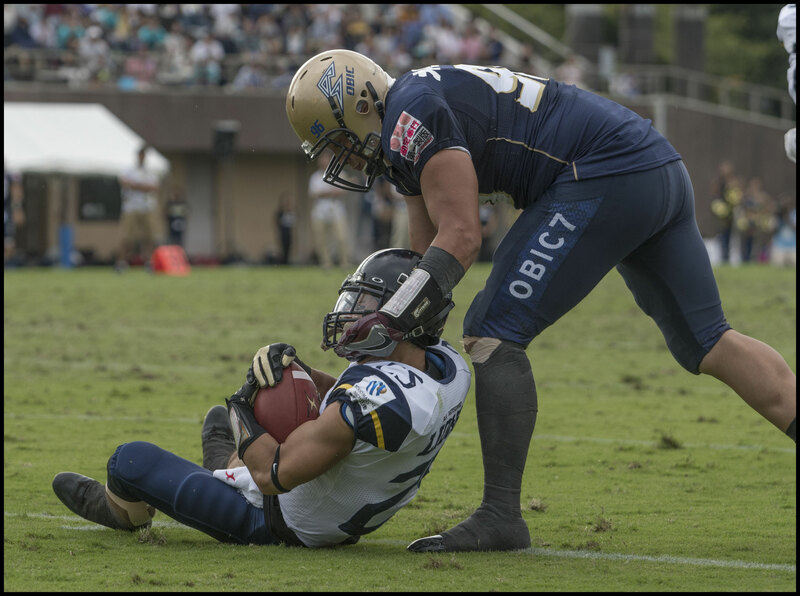 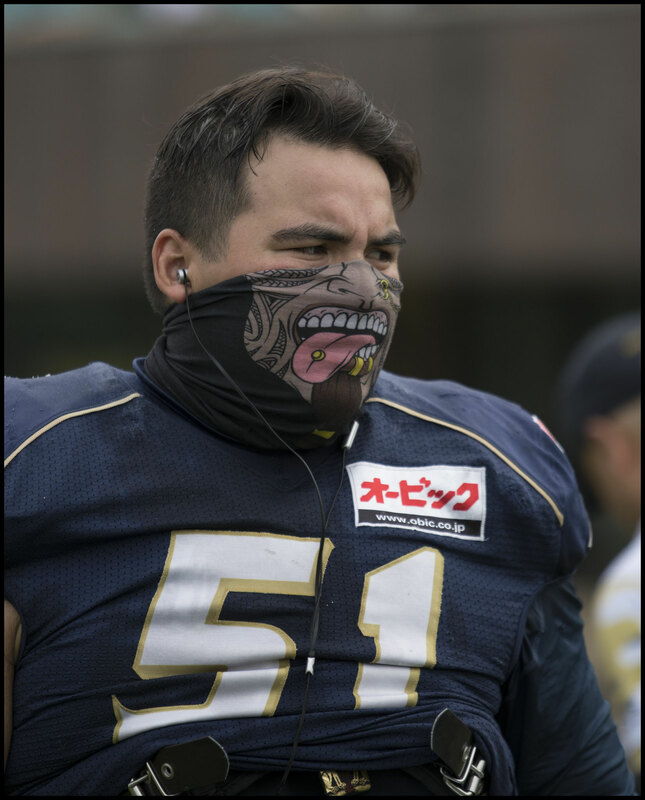 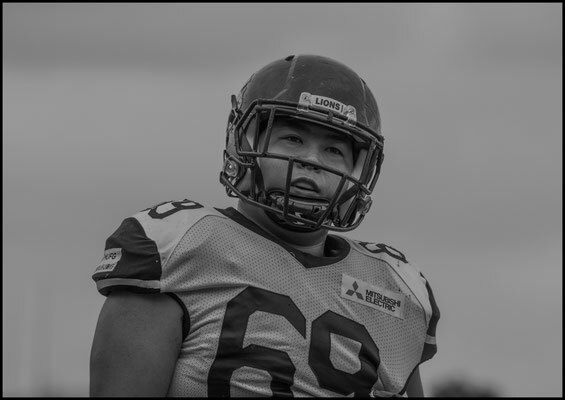 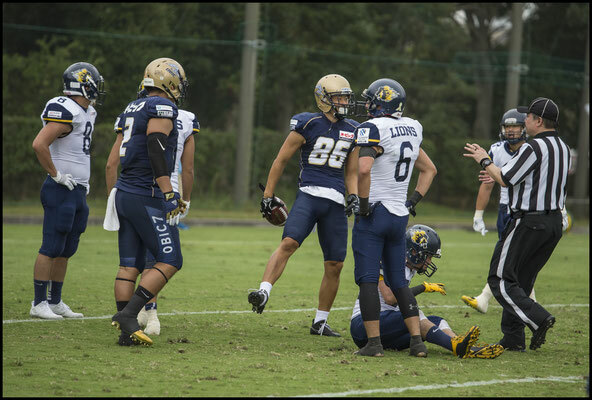 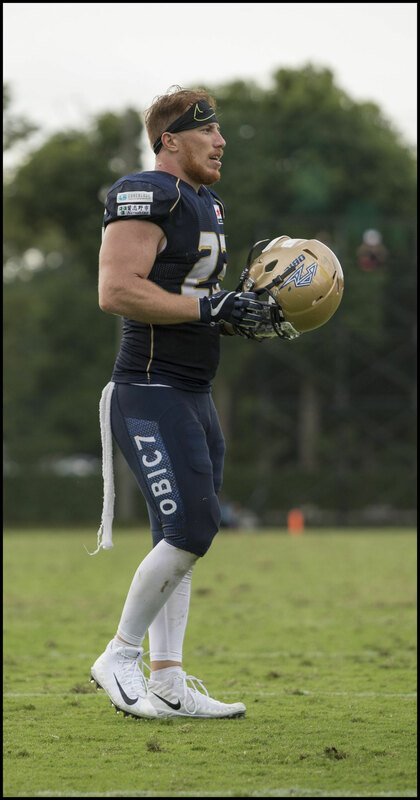 Following up a narrow loss to IBM, with a close victory over Nojima, Obic Seagulls proved on their home field in Narashino, that they are still a class apart from the best the Battle 9 has to offer, romping past the All-Mitsubishi Lions 52-0. 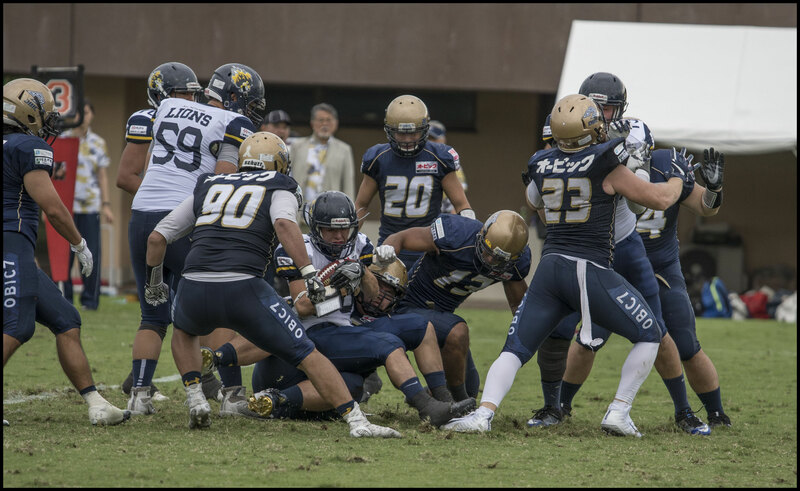 Doubts raised by the Lions performance in their first two outings - they stole a win from the Pirates and struggled to pull away from the Bulls - will only be strengthened after this game. 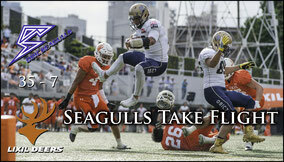 Only two Seagulls drives failed to end in a score, one a punt and the other an interception. 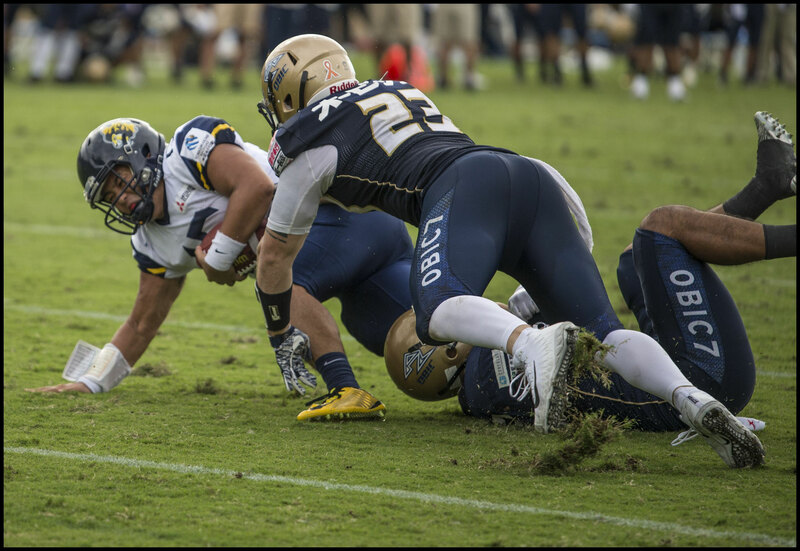 Both came during an offensive lull late in the second quarter. 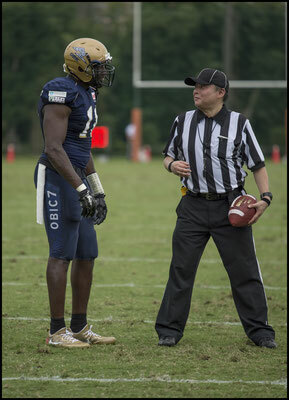 This is far from the whole story though. 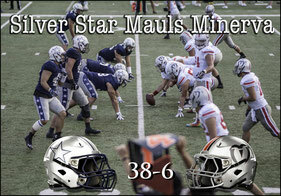 The one-sided score didn't really reflect the general play. 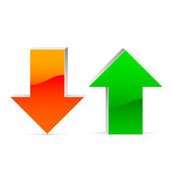 Obic had only four more first downs than the Lions - not a glaring difference. 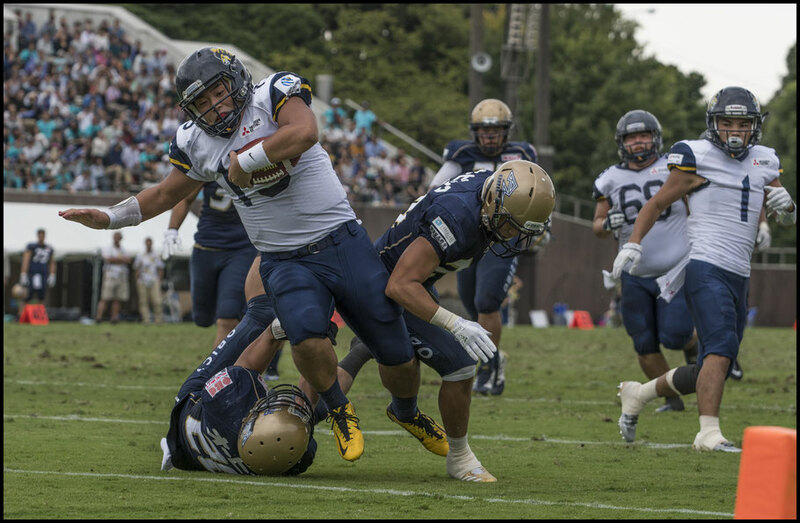 They did have almost double the rushing yardage at 191 yards to 101, but mainly because Obic ran the ball noticeably more than All-Mitsubishi. The most obvious difference was Obic’s 77% completion percentage compared to the Lions' 48%. 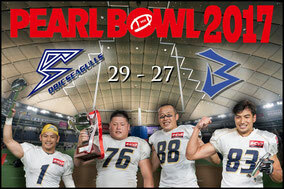 But again this was not reflected in yardage where the Seagulls out-threw the Lions by only 301 yards to 256. 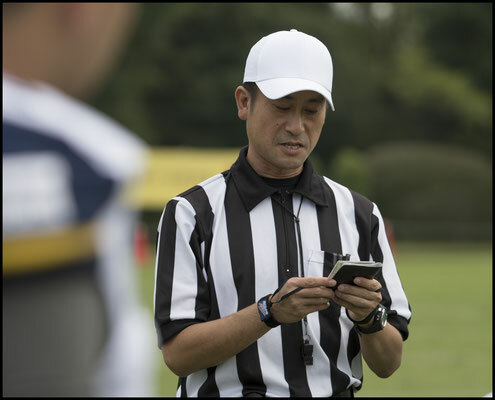 Most striking was the fact that All-Mitsubishi actually held the ball for almost two minutes longer than the team that ripped them for seven touchdowns and a field goal. Even the often bellwether turnover differential - three interceptions to one in the Seagulls favor - does little to explain this thrashing. 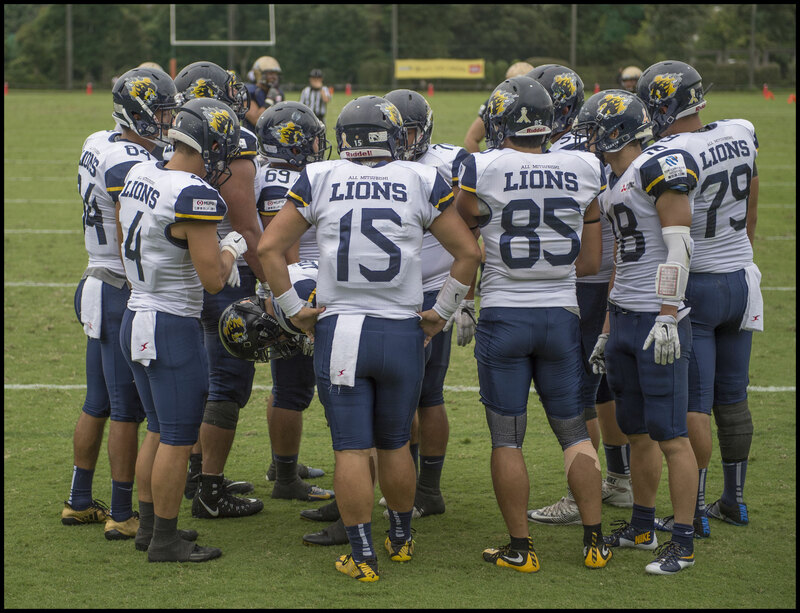 Only two of these interceptions led to scores, for a total of ten points, both in the fourth quarter long after the game was well out of range for the Lions. 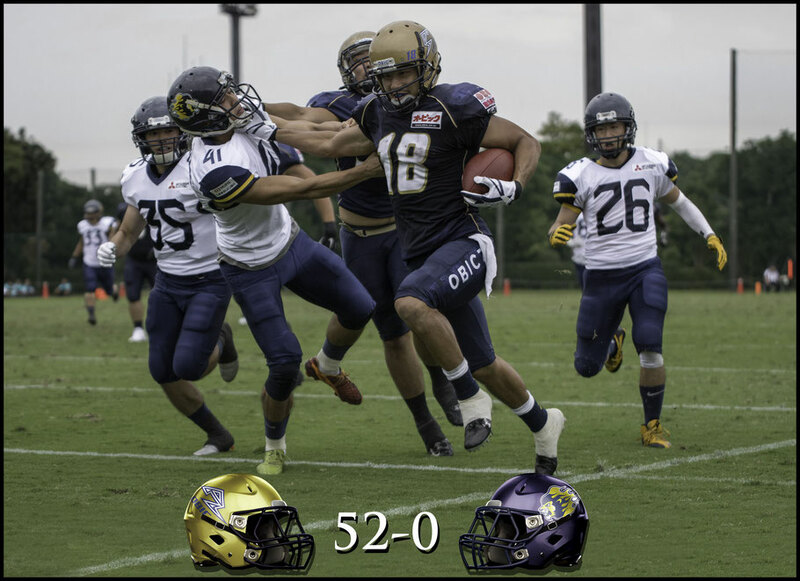 So what explains the scoreboard? 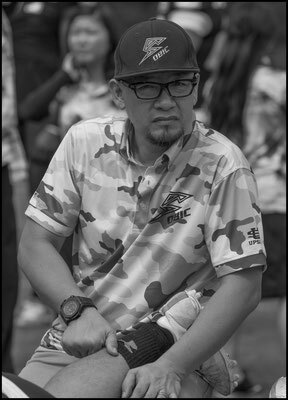 On the Obic side, what made the difference was its diversity of weapons. Yardage in both passing and rushing was spread out between multiple players. Obic’s passing game, even without injured Hawaiian QB Ikaika Woolsey, was second to none, with a whopping average of almost 18 yards per completion. QB Shun Sugawara threw for 252 yards with only four incompletions and one interception. 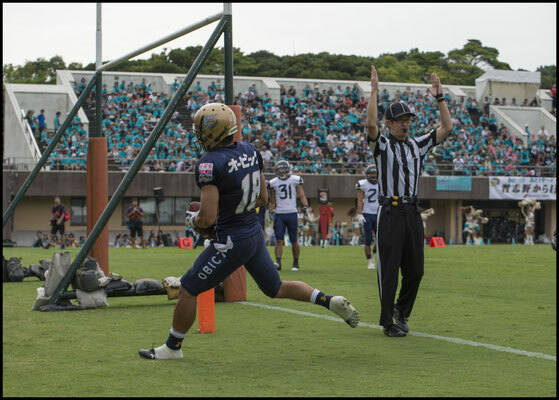 QB Takeshi Masukawa filled in occasionally, completing three of four attempts for 49 yards and a TD. 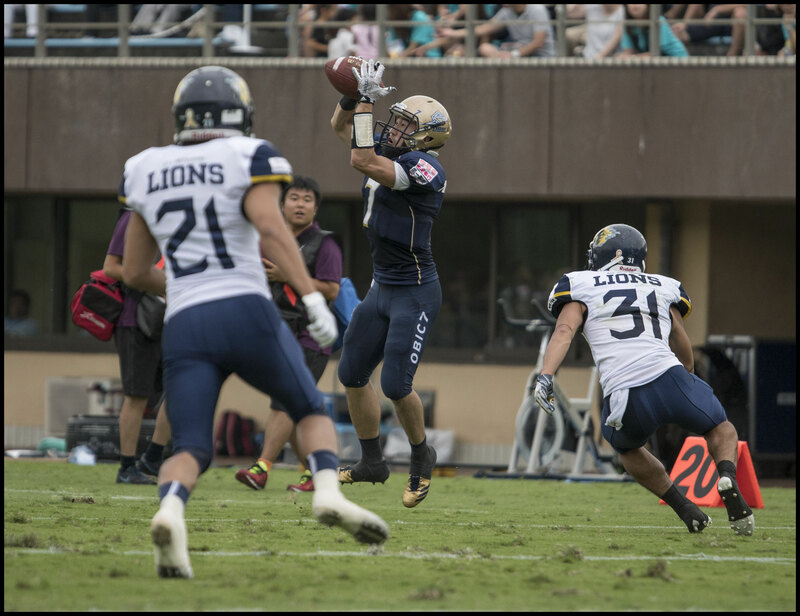 Passing was spread between ten receivers with only a few of them catching more than one ball. This left Mitsubishi’s secondary at a loss for which jersey numbers to focus attention on. 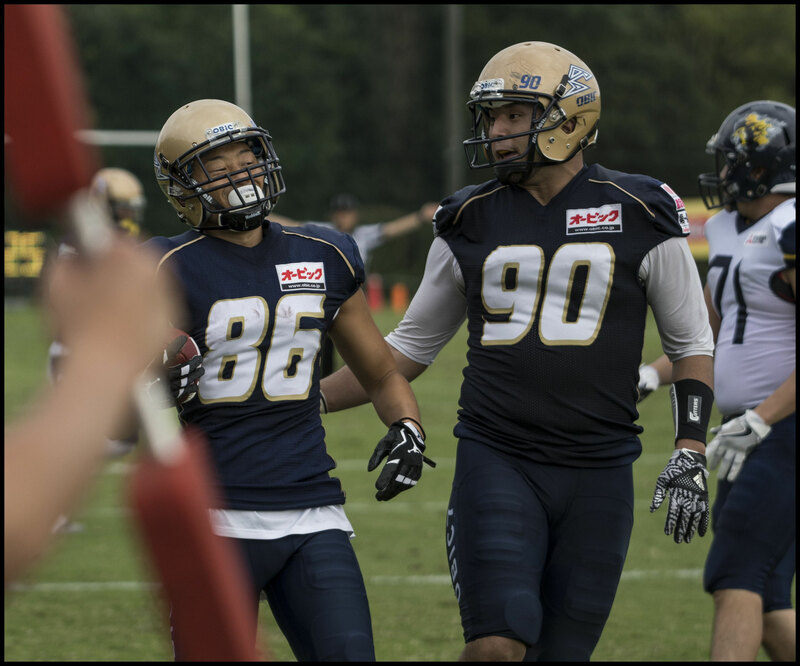 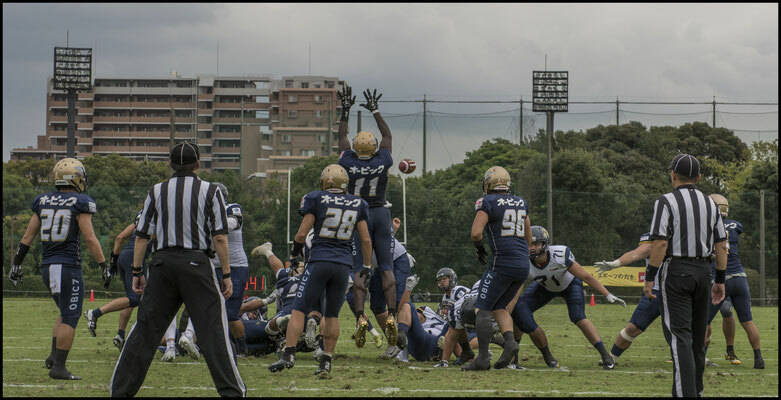 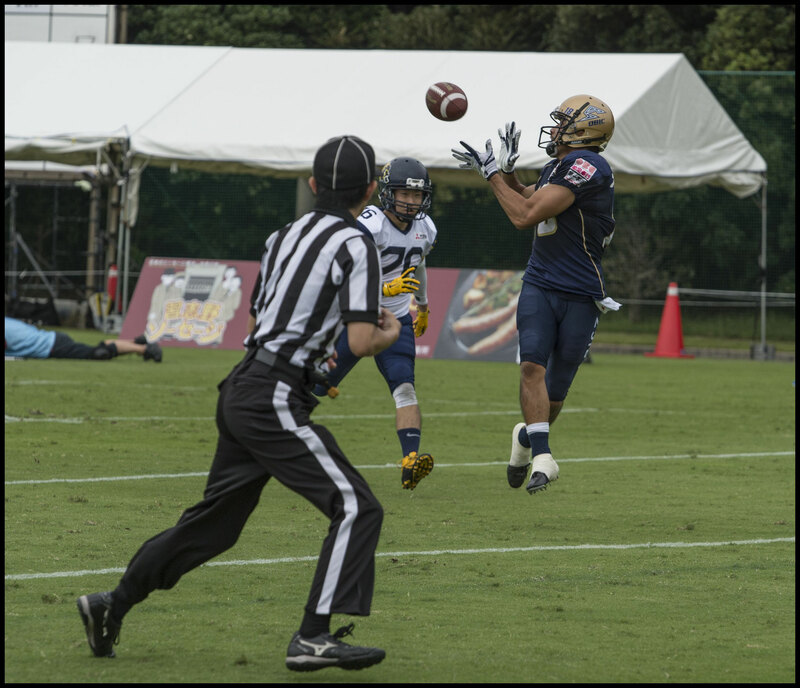 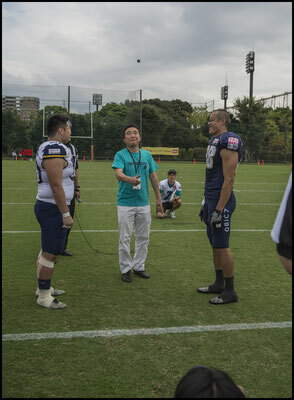 Three receivers that stood out were Takahiro Nozaki, Shingo Maeda and Noriaki Kinoshita. 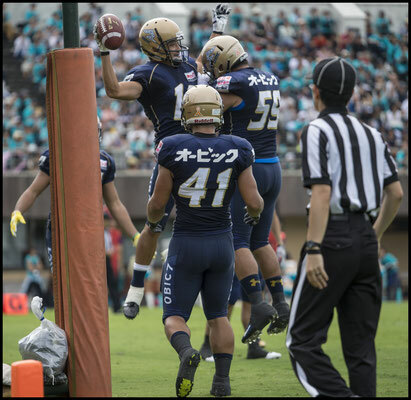 Kinoshita caught three passes for 56 yards with two of them being TDs. Obic’s running game, while not as dynamic, was equally diverse, with nine men carrying the ball. 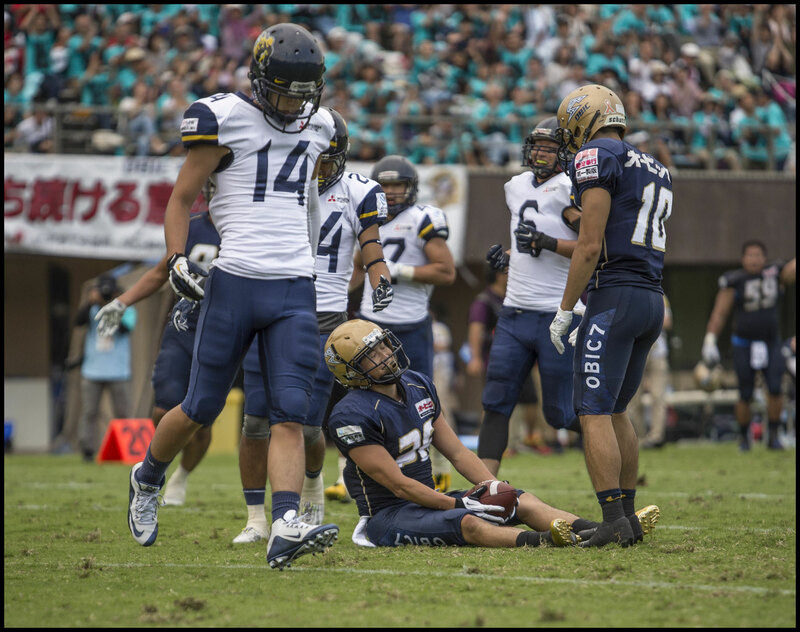 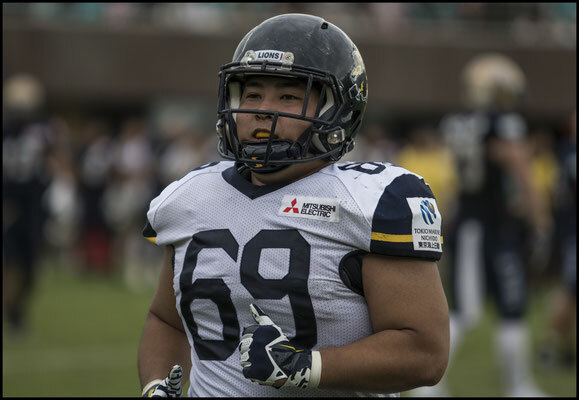 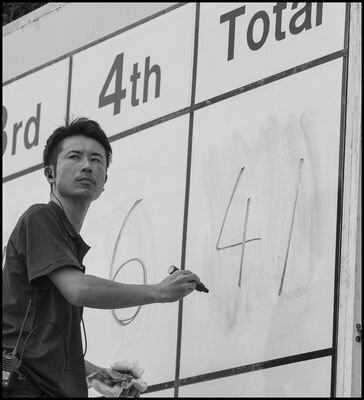 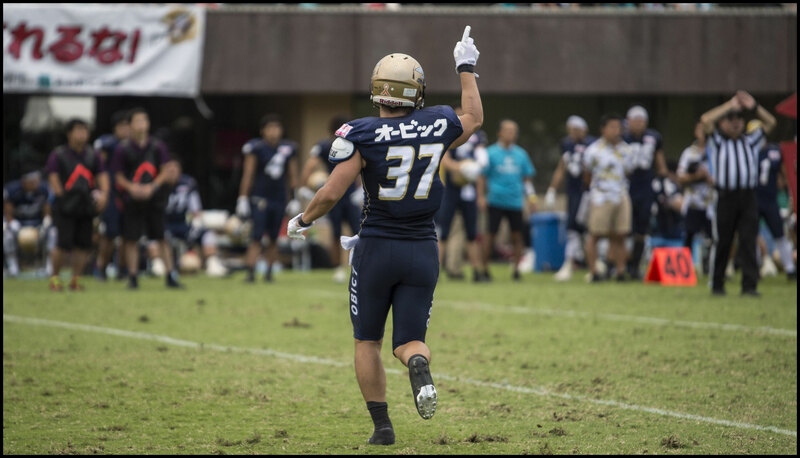 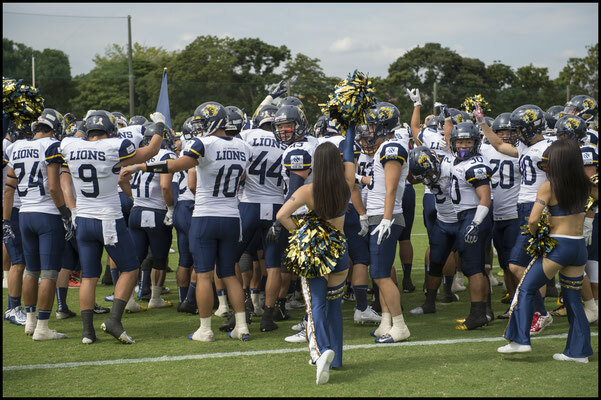 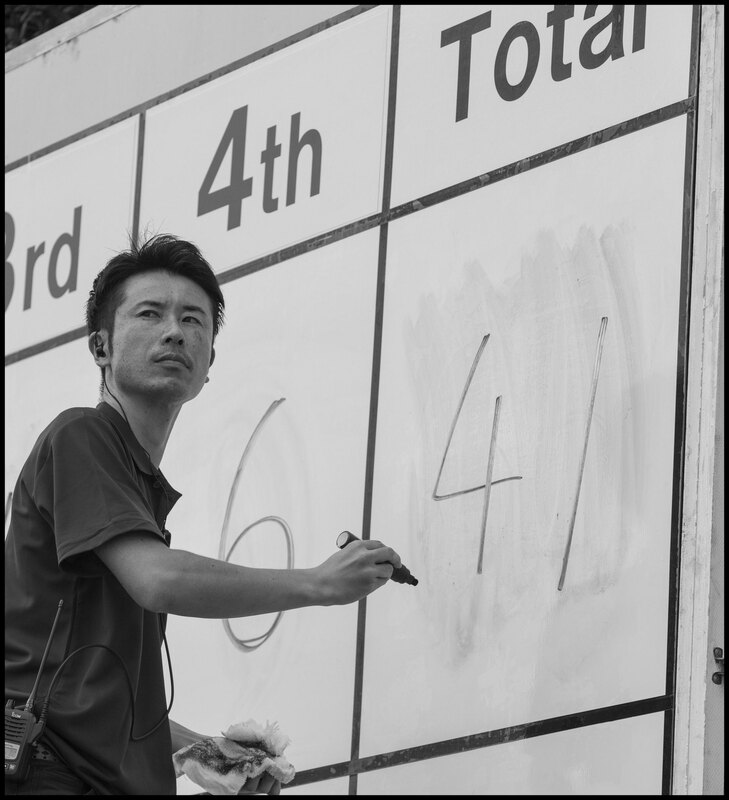 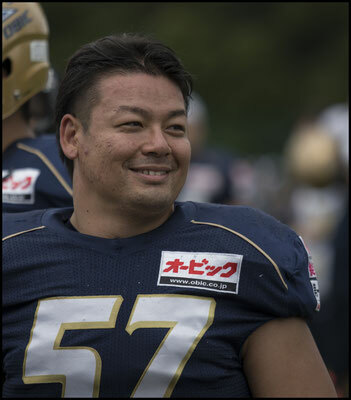 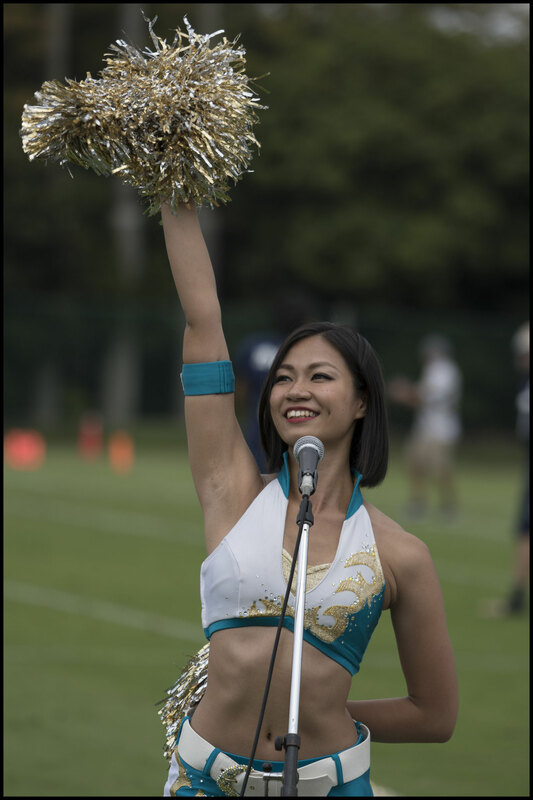 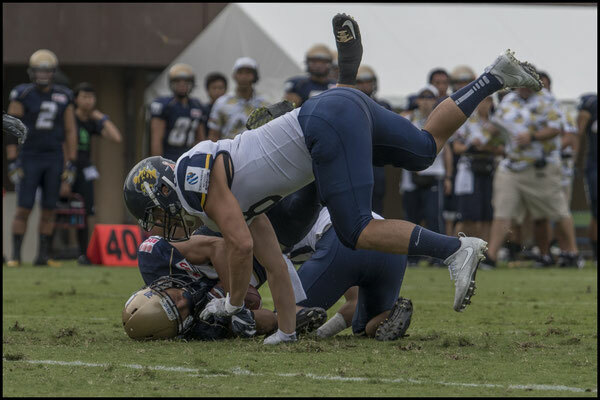 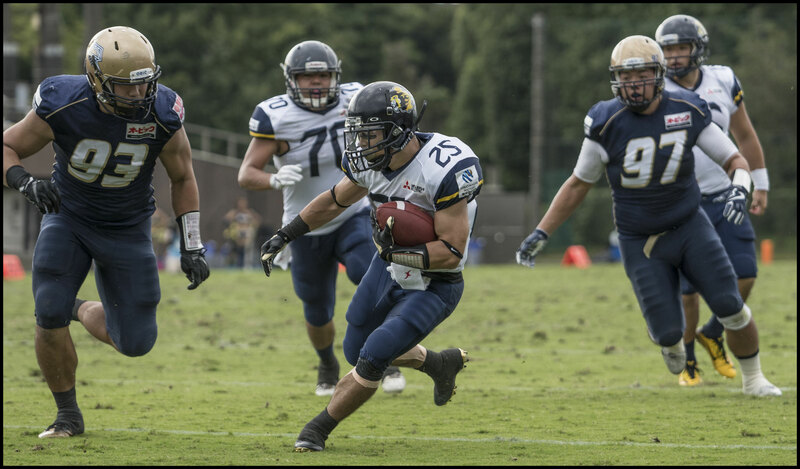 Tomoki Chimura was called on most, carrying nine times for 37 yards.Hiroki Kato found the most open field, gaining 57 yards on six carries and Keita Naruse was the go-to man on short yardage, accounting for Obic’s two rushing TDs. 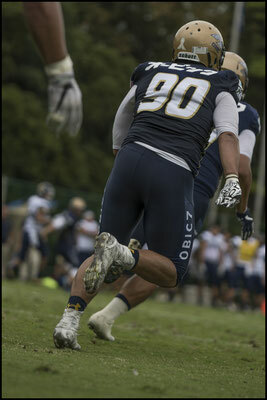 The run play that everyone will remember though was by DL BJ Beatty. He was brought in on a punt fake on 4th and long, and took the defense completely by surprise, going 37 yards, over and through Lion’s players to the 17-yard line. Beatty when asked about this after the game related that the team has a lot of fakes in the playbook, and when he saw an opening he asked the coach if he could run it. “(The coach) was like ‘can you get the first down?’ and I was like ‘yeah, I can get the first down.’” This surprise tactic set up a TD pass on the very next play to WR Kentaro Mori no.10, his only catch of the day. On the Lions side, the offense was far from stymied. 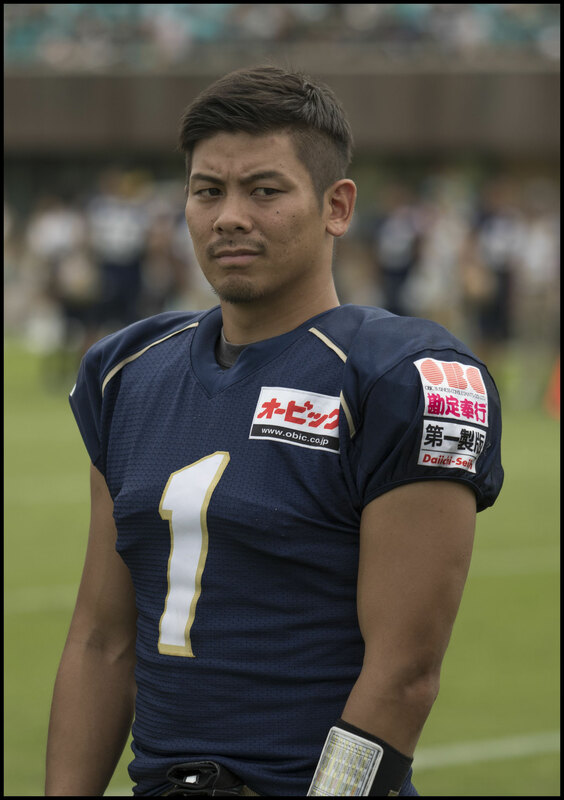 QB, Shoma Taniguchi who also substituted as an able kicker, scrambled on seven plays for 30 yards. He completed less than half his passes, but still threw for 149 yards, with a long of 39 to WR Ryunosuke Saeki, who had four grabs for 63 yards on the day. 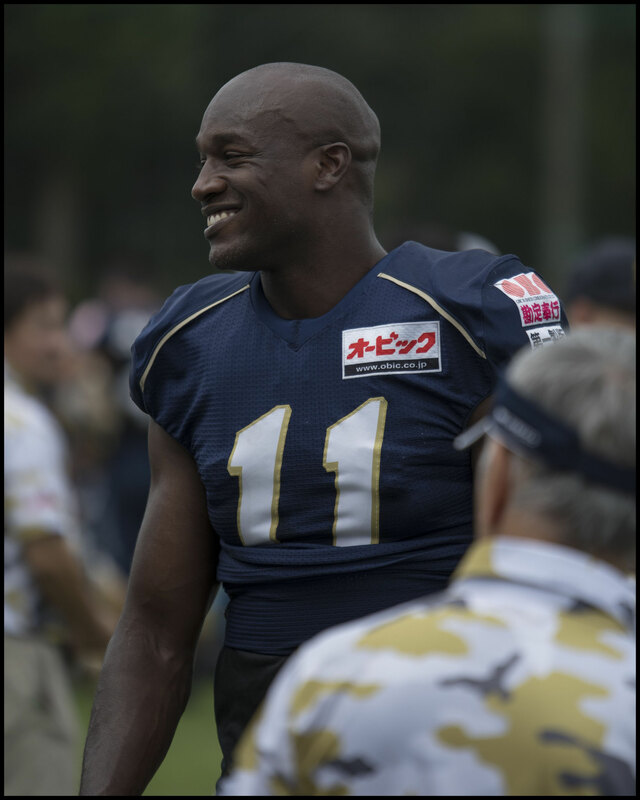 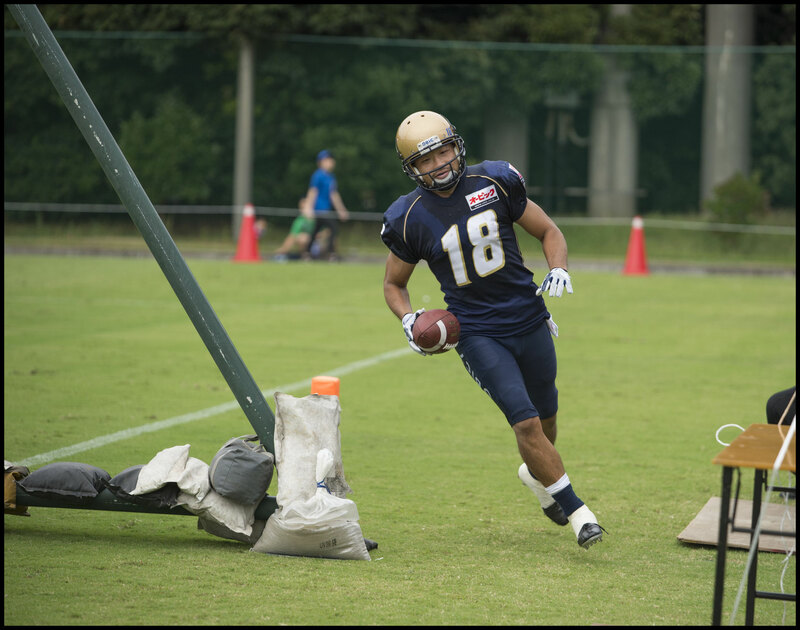 Wideout Kazuki Danguri caught three passes for 57 yards. 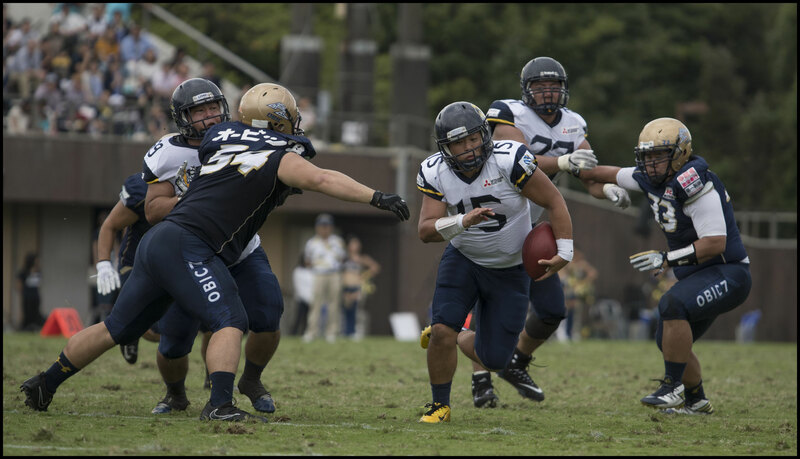 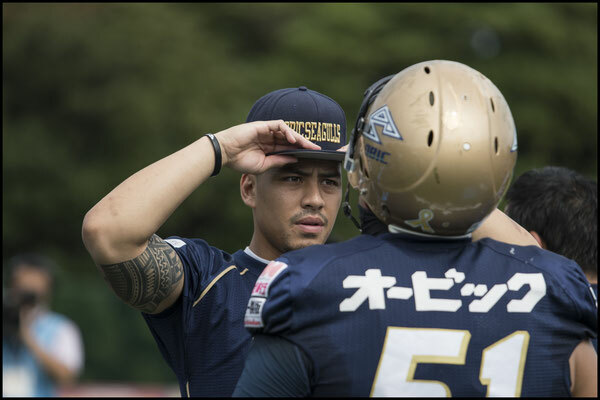 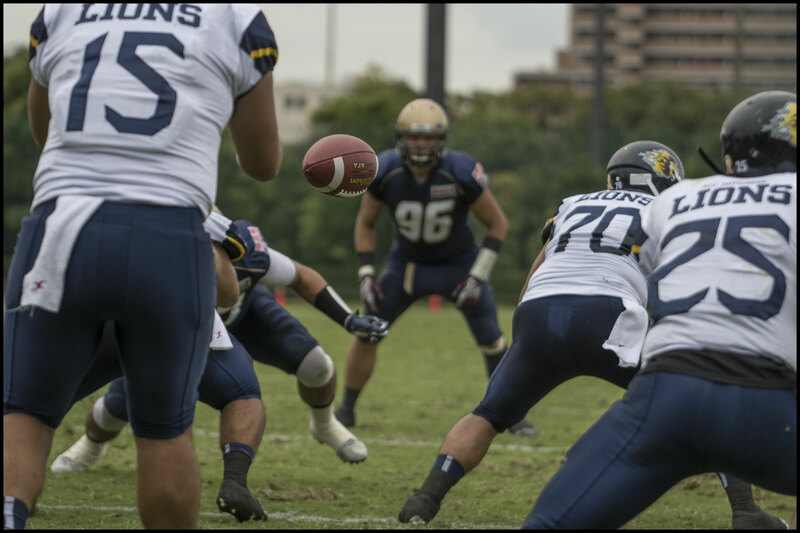 QB Kei Saito shared snaps with Taniguchi and completed half his 16 passes for a total of 114 yards. 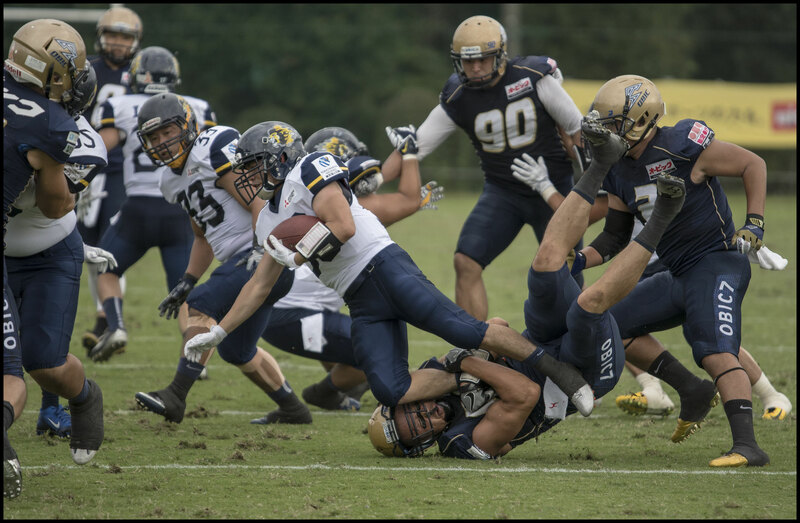 On the ground, the Lions found less success. 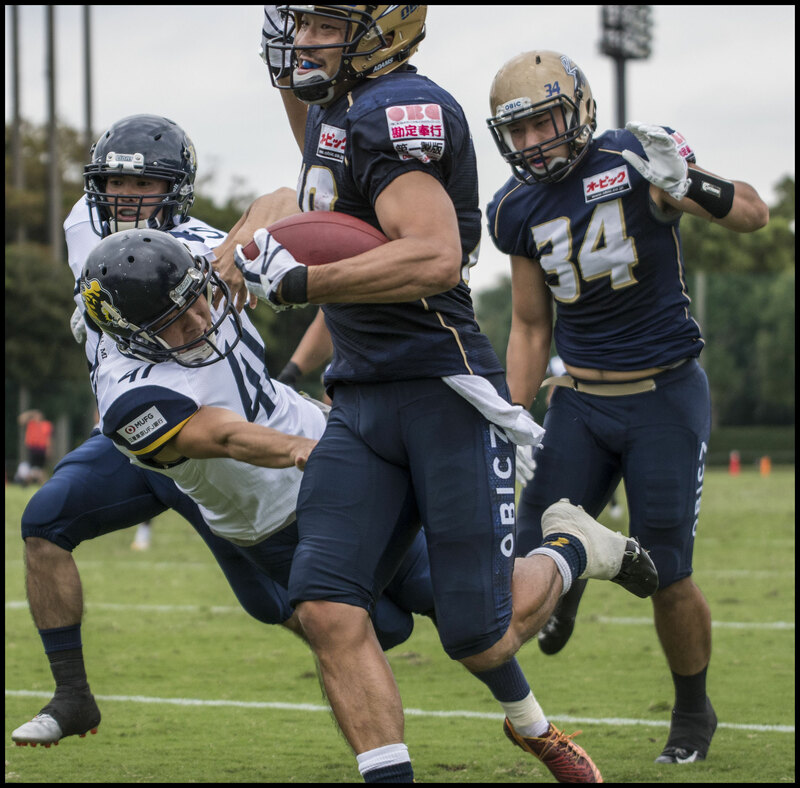 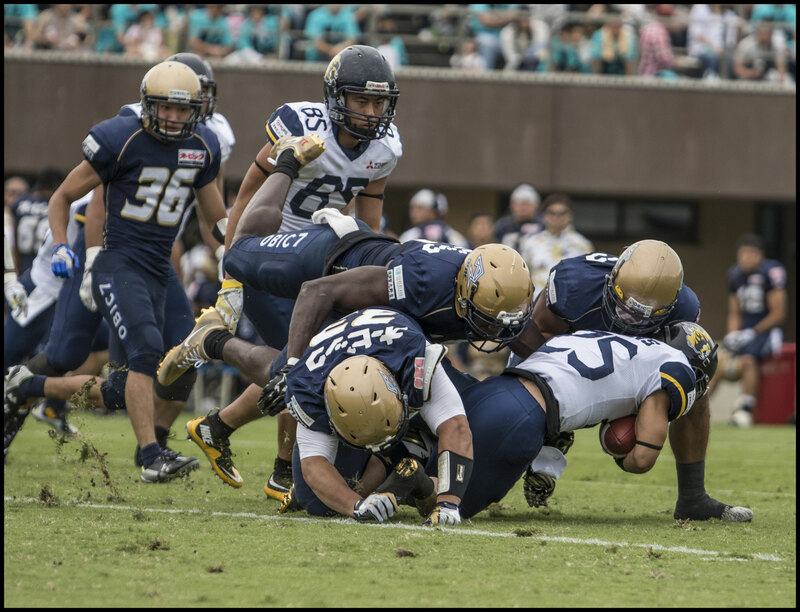 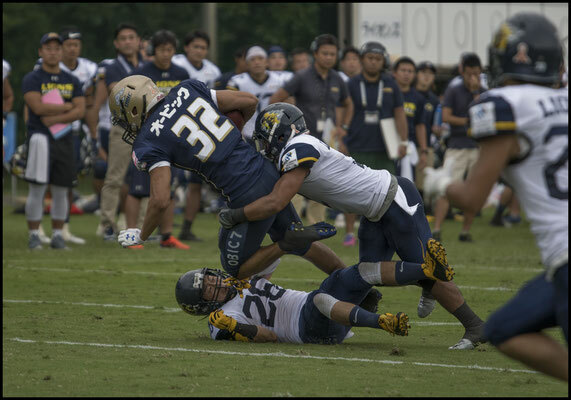 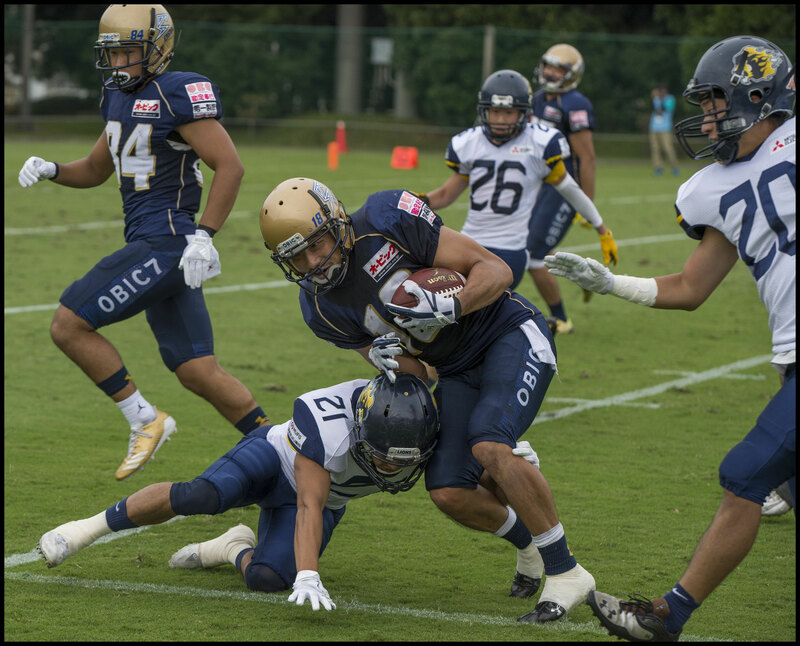 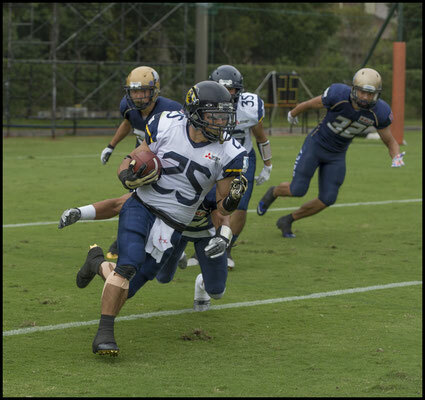 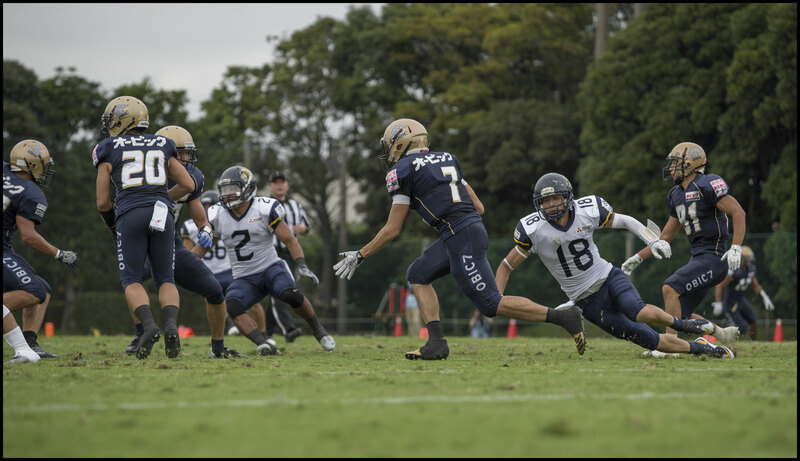 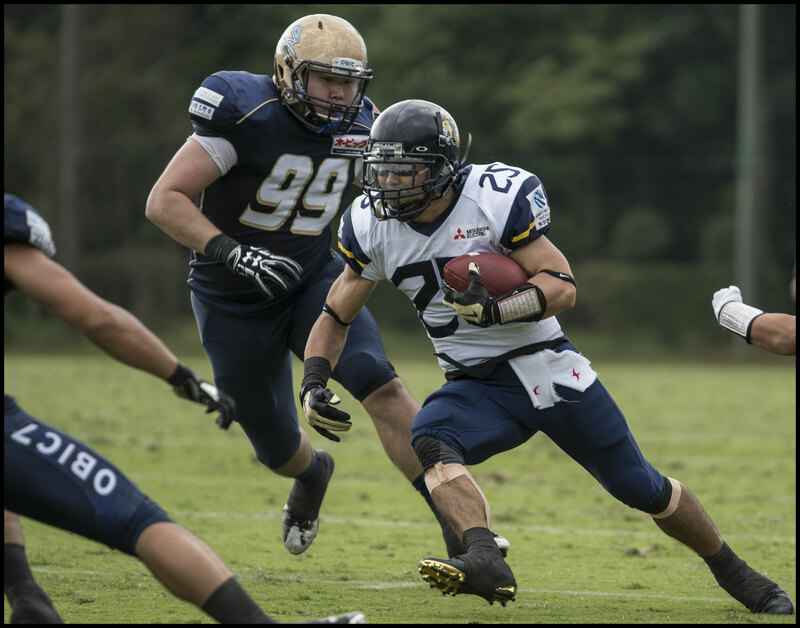 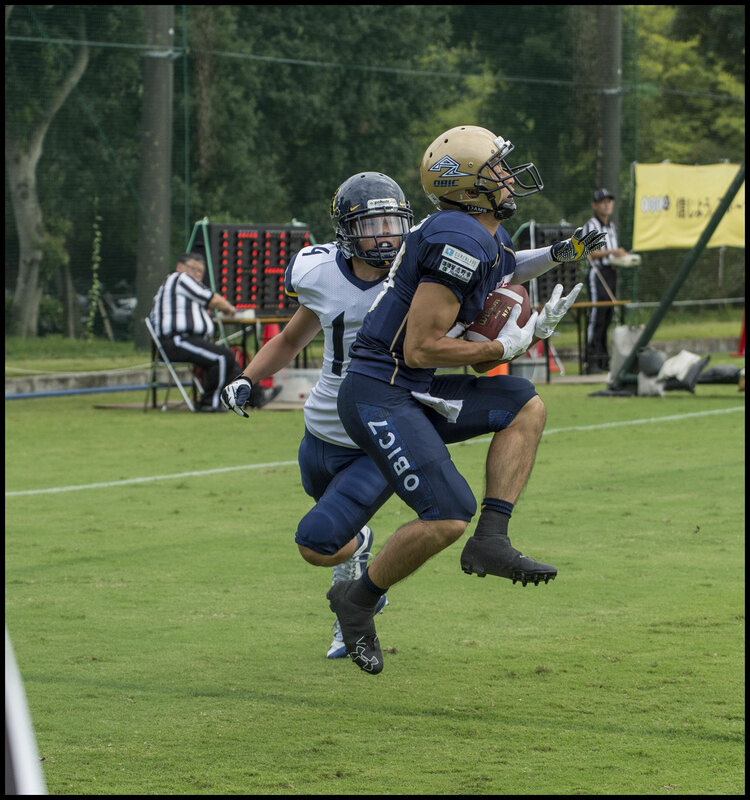 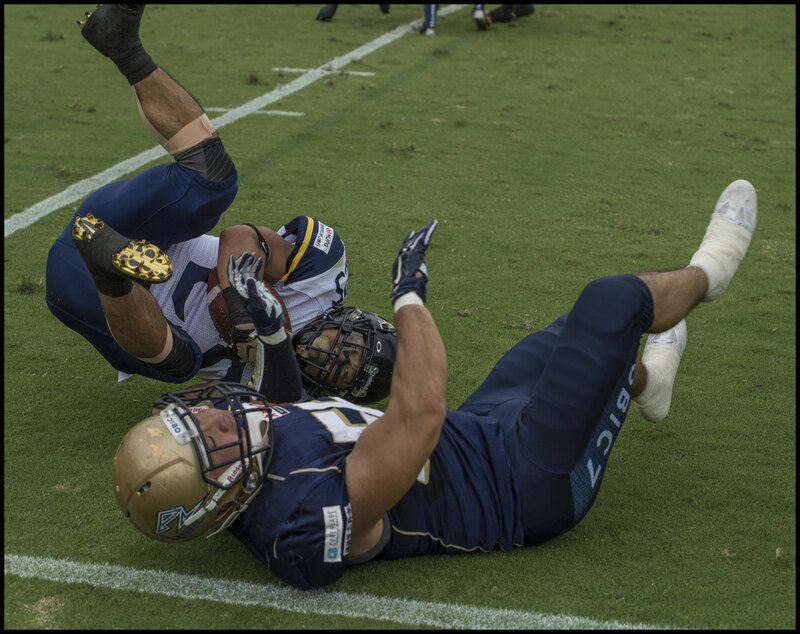 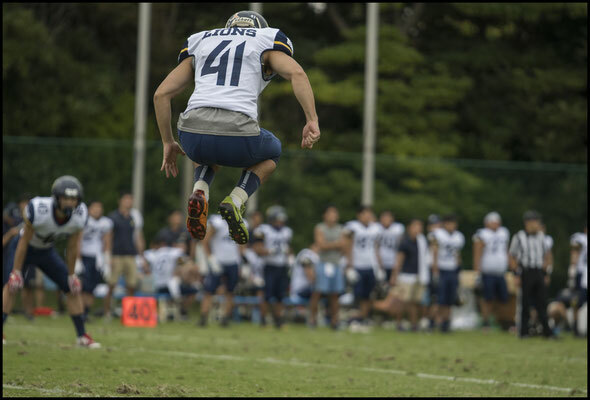 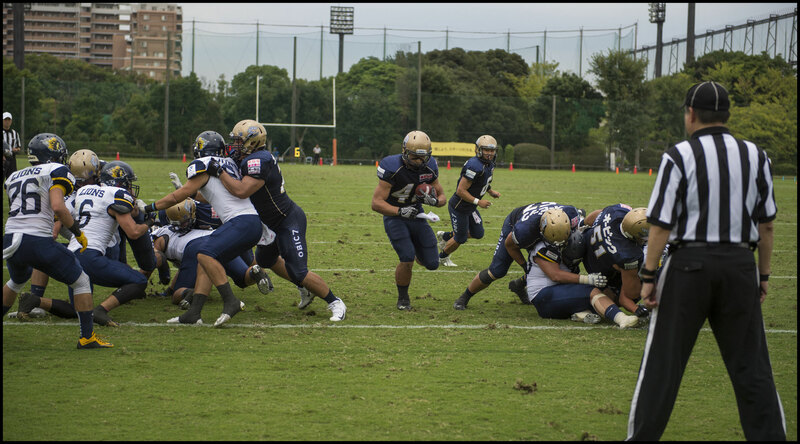 Only RB Ryosuke Ogata, with an eye-catching average of 10.6 yards on five carries, stood out. 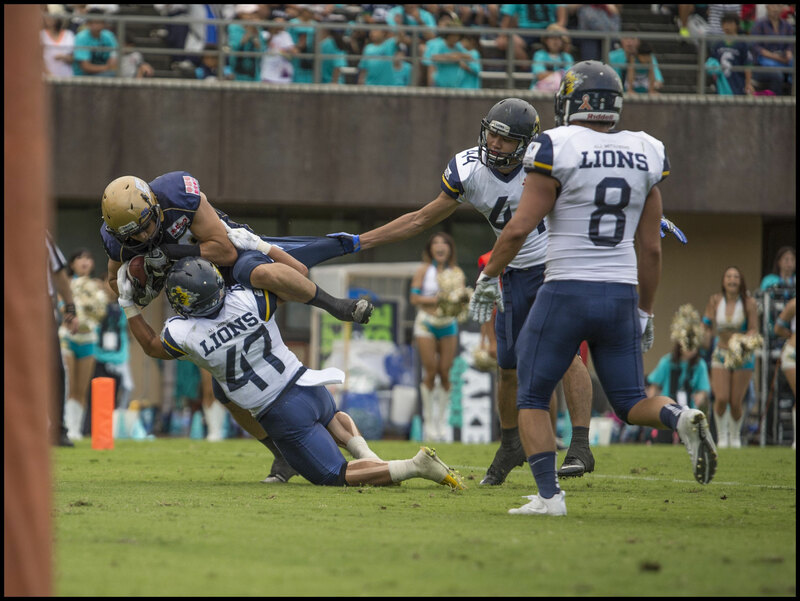 What led to the goose egg was the fact that the Lions’ offense simply seized up every time it got within striking distance of the goal line. 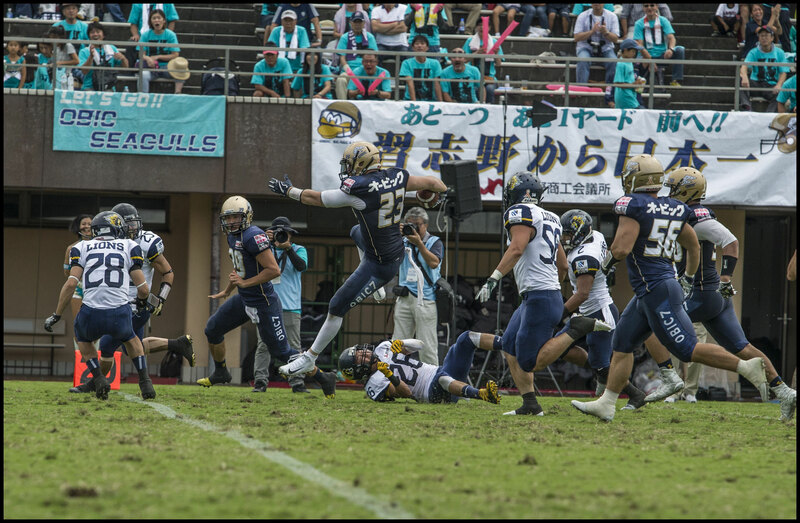 On five occasions All-Mitsubishi drove from deep in their own half into Seagulls’ territory only to have their progress stopped cold. 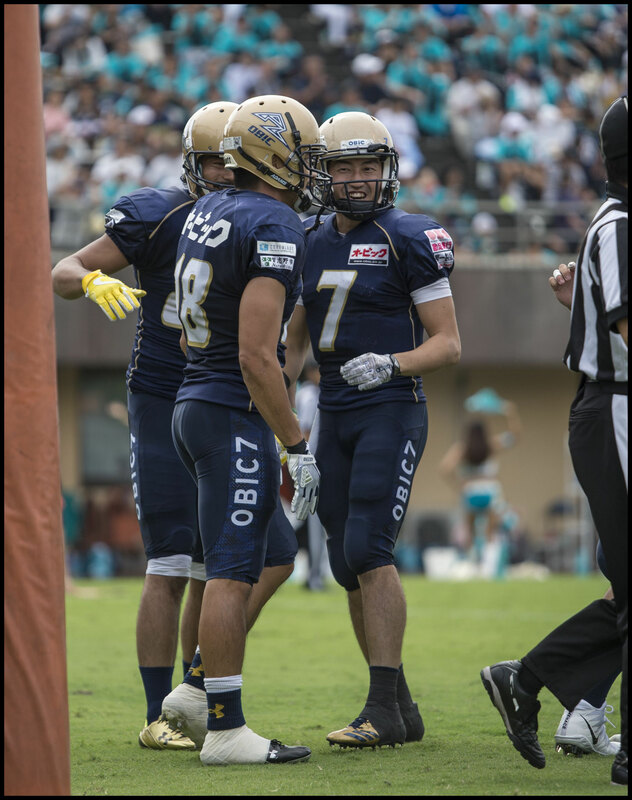 The first two were attempted field goals, one blocked and the other missed. The worst of the wasted opportunities though was after the Lions drove all the way from their own 17 to the Seagulls’ two yard line, only to have four plays stopped short, turning over the ball on downs. 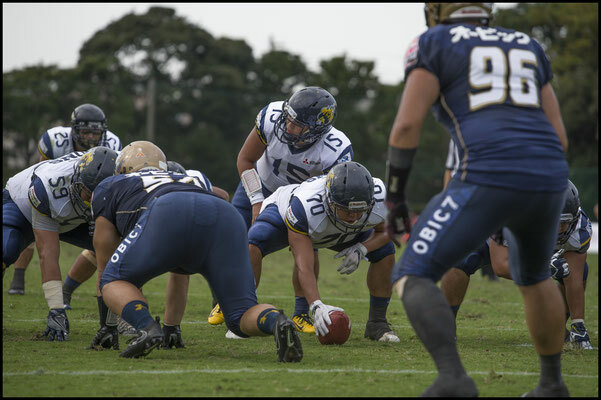 Obic next faces Asahi Beer Silver Star, while All-Mitsubishi will hope for more success when they contend with the Metropolitan Police Eagles. 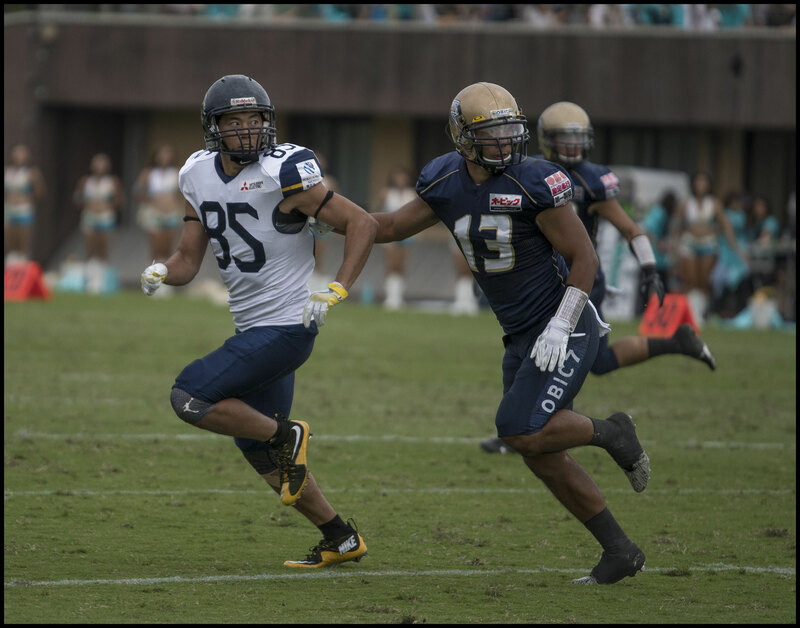 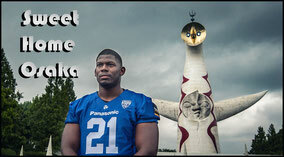 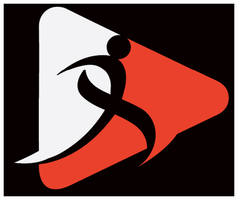 Both game are on Oct 7th at Fujitsu Stadium in Kawasaki.